WELCOME TO KODERMA: "The Mica Capital of India"
District Koderma the mica capital of India came into existence in 1994 out of the old Hazaribagh district of the North Chhotanagpur Division. Koderma and Tilaiya are only two important towns in the district. 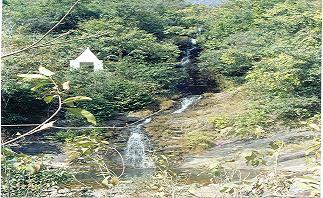 Koderma is district town of Jharkhand and is well known for rich mica deposits and is also called as "Abharkh Nagari". Jhumri Tilaiya, Tilaiya Dam, Urwan Tourist Complex, Dhwajadhari Hill (Pahari), Satagawan Petro falls, Saint Paramhans Baba Tomb, Makamaro Hills, Shaktipeeth Maa Chanchala Devi. 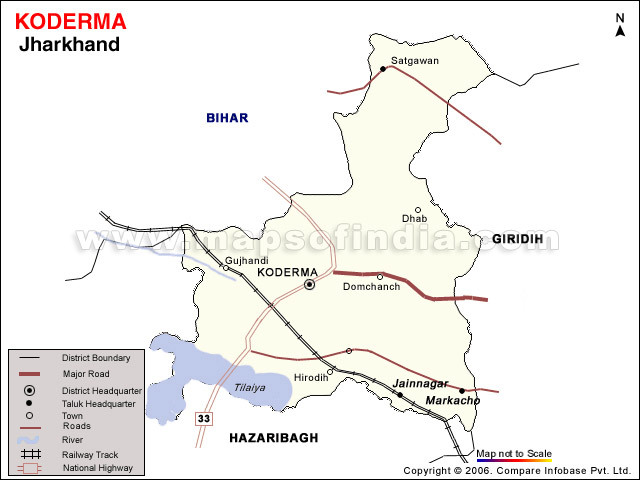 Koderma town is on the National Highway 31 connecting Ranchi and Patna. Koderma Railway station is also on the grand chord railway line connecting Calcutta and Delhi. Grand chord railway line was primarily laid for the quick movement of coal from Jharia & Raniganj coalfields. TILAIYA DAM: It is the first Dam and hydro -Electric power station constructed by Damodar Valley Corporation across Barakar River, in Koderma district. The dam is 1200 ft long and 99 ft high situated in an ideal surrounding with a beautiful reservoir in 36 sq km area. Built with the main object of controlling floods, the hydro -electric station produces 4MW. The beautiful natural surroundings are the attraction to tourists. The main road from Barhi on G.T.road through reservoir and the hillocks is picturesque. URWAN TOURIST COMPLEX: Few kilometres from the Tilaiya dam is Jharkhand State tourism Development's Tourist Complex at 'Urwan', where one can consider spending time by the side of the dam, where one can enjoy boating and other water sports. Interested tourists can follow the main road and drive to Hari Har Dham at Bagodar which is famous for the 52 feet high Shiv Ling which took 30 years to complete and is believed to be the tallest in the world. 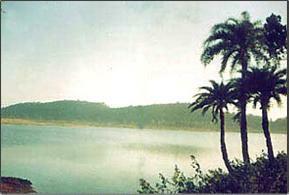 DHWAJADHARI HILL (PAHARI): Few kilometres from the Tilaiya dam is Jharkhand State tourism Development's Tourist Complex at 'Urwan', where one can consider spending time by the side of the dam, where one can enjoy boating and other water sports. Interested tourists can follow the main road and drive to Hari Har Dham at Bagodar which is famous for the 52 feet high Shiv Ling which took 30 years to complete and is believed to be the tallest in the world. MAKAMARO HILLS: The Makamaro hill near Dhab also has some religious relevance. It is beleived that Parsuram had killed his mother and three brothers here on instruction of his father. 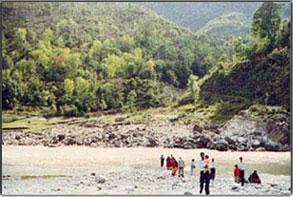 SHAKTIPEETH MAA CHANCHALA DEVI: Situated in the Koderma-Giridih highway around 33 kms from the district headquarters. Maa chanchala devi temple is situated about 400 ft above the hilland is one of the form of goddess Durga.. Nearby hill there is a big cave having rock paintings of four forms of goddess Durga. Entering into the cave is difficult as the passage is very narrow.A large number of devotees reached here on Tuesday and Saturday in a week. Prasad used is Arwa rice and mishri.The use of sindur is prohibited. A large number of marriages, Mundan are solemnized here. Devotees has to go after taking bath. Violation of this rituals leads to punishment of insects bite. SAINT PARAMHANS BABA TOMB: At Domchanch , there is a tomb of saint Paramhans Baba, where people from remote areas come to worship.